By using new and efficient technologies, SES Technologies is able to harness available natural resources with minimal impact on the environment. The Renewable Power Resource Stations (RPRS™) is a highly efficient, low-maintenance, non-intrusive, low-cost power generation unit. Combining the use of efficient generation devices, the RPRS can be readily adapted and scaled to accommodate nearly any environment. The station can be either mobile or stationary (Model of stationary unit shown above). 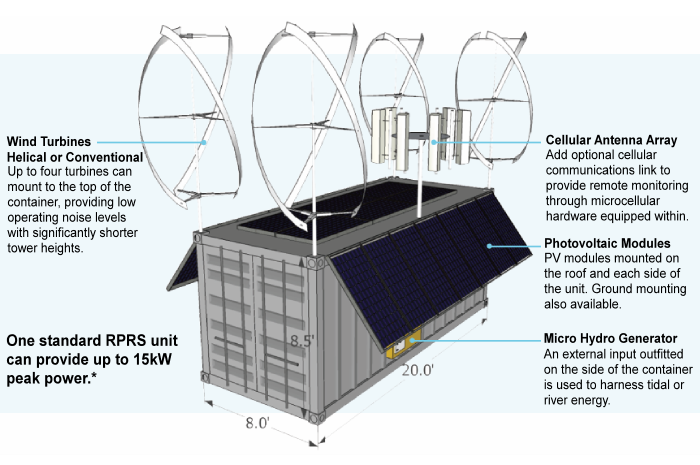 The individual renewable energy units are designed to be installed onto a standard 20-foot shipping container. Custom units can be designed to generate power ranging from kilowatts to megawatts. *The power output of each renewable source was formulated using typical values seen across various vendors' products and is only an average. Ideal conditions for sunlight, wind, and water flow were assumed for the given calculations. A stationary unit can be fit to a specific energy requirement by varying the number of PV panels used and also by adjusting the number and style of wind turbines employed.